Your Oyster Recipe of the Day: Rouses Baked Oyster Rockefeller Dip. Melanie (a founding member of the Oyster Obsession Facebook group), shared this recipe from her hometown grocer. Rockefeller flavors with cream cheese! Yum. Heat 1 tablespoon of olive oil in a skillet over medium heat. Sautée oysters just until they plump. Remove oysters from skillet and set aside. Add one tablespoon of olive oil to skillet and sautée spinach until it wilts, then add cream cheese and Parmesan, stirring until cheese begins to melt. Remove from heat. Add the next 8 ingredients (through parsley) to the spinach mixture. Add oyster to mixture and stir gently to blend. Spoon into a greased 8 x 8 casserole dish. Top with breadcrumbs and remaining Parmesan cheese. Bake for 25 minutes or until bubbling with golden top. Note: For individual servings (shown in video): Following step 4, spoon equal amounts of oyster mixture into 12 reusable stainless steel oyster shells. Top each with breadcrumbs and Parmesan. Bake for 25 minutes. 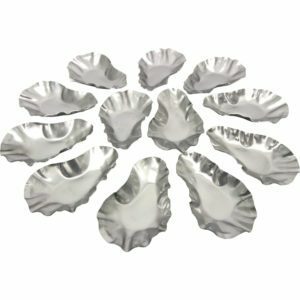 SOS stainless steel reusable oyster shells are available at Amazon.com and kitchen supply stores. Disclosure: Some of the links on this site are affiliate or sponsor links, meaning, at no cost to you, Oyster Obsession may earn a commission when you click through and make a purchase.